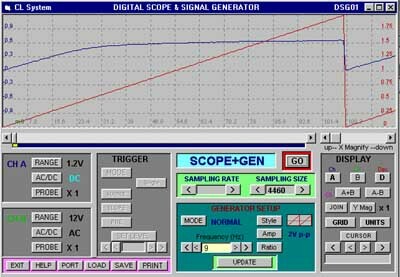 The digital scope and generator functions can be combined to produce a component analyzer for devices such as inductors, capacitors, transformers and transistors. The simplicity and ease of use is ideally suited to students, professionals and hobbyists. The compactness of the unit allows field use with a portable computer and battery pack. There is currently no comparable equipment with the specified features at the DSG price level. It is now even better with the added FFT functions. Capturing Infrared remote command signals and regenerating them. With a simple infrared receiver the DSG can capture and save infrared remote control signals. These can then be analyzed or modified and sent out again. For diagram and instructions click here. Plotting bandwidth of analog circuits. DSG can be set to output a sweeping sine wave and capture the resulting output signal at the same time. The corresponding display is the amplitude Vs frequency response curve. Ideal for looking at filters and tuned circuits response. Example display of a R-C + R-C filter, in this case, DSG sweep output is fed directly to two, 10KOhms resistors and 22nF capacitors, and the resulting signal captured and displayed. Plotting frequency spectrum of a signal via FFT. 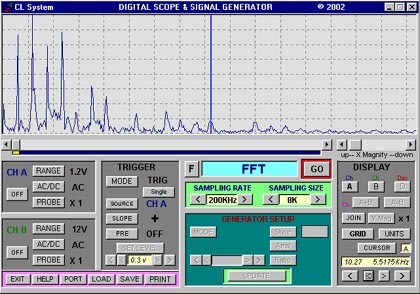 Example, using the DSG FFT functions the spectral frequencies of a captured audio signal, in this case a scream, are displayed. Another example uses the FFT to compare a square wave and a triangular wave of different frequencies. 1. 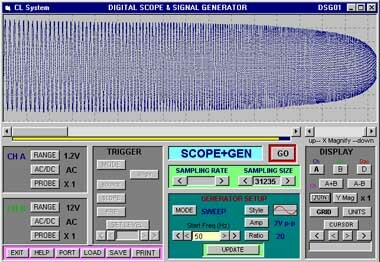 One channel display can be frozen for use as master for quality checks during musical instrument production where a master copy of spectral plot is compared with a production copy. Production copy is then adjusted to match master (NB 32Kbytes maximum sample length). 2. Comparing background noise of audio and power supply circuits to show up unstable, oscillatory conditions. Plotting discrete component behaviour. 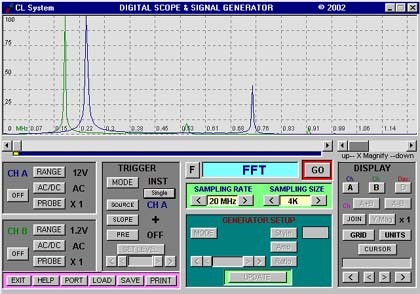 Example, using the DSG Saw-tooth signal generator and applying it to a diode, the response characteristic of a diode is displayed. Checking transients response of circuits during power up or down. Questions are always ask.. Is my power supply generating glitches on switch on? Why do my circuits crash frequently for no reason? Well the DSG is well placed to quantify your doubts. Firstly it can be use, via the signal output together with a custom timing sequence, to control the events that you think may be the cause of the problem. The resulting output can be captured and analyzed in detail and may prove whether your fears may be founded. Secondly, you can simply use the trigger function of the DSG to capture glitch events if and when they occur. It it surprising to view how a power supply voltage output stabilized during power-up with differing loads. Generating transient signals to test circuit behaviour to glitches and surges. 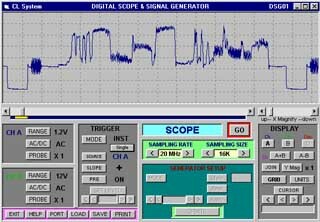 Captured or custom designed glitch waveforms can be generated by DSG and injected into electronics circuits to test their susceptibility to noise. 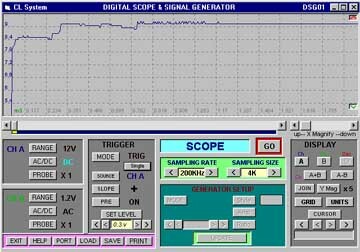 Custom digital pulses in steps of 50ns (20 MHz model) can also be generated. Testing digital circuits. 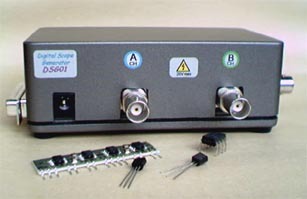 The square wave output of the DSG is used as the clock input to the digital circuit under test. The resulting digital output is captured simultaneously. The captured waveforms and DSG output signal are both displayed together aiding in the quick verification of the circuit functions. 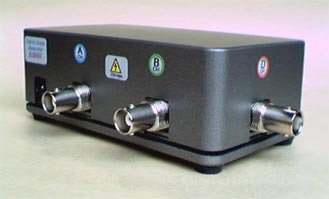 Ideal for capturing and analysing video signals. General video signals are always changing and difficult to view. To be able to capture and display a single horizontal scan is a further benefit in using DSG.